The major source on the history and cultural heritage of the Tigua Indians (and other Native Americans of the El Paso region) is the Five Volume series published by the Tigua Tribe. It is entitled Ysleta del Sur Pueblo Archives, and is available in major Texas libraries (colleges & cities). The edited compendium includes comprehensive studies by the major scholars including anthropologists, historians and others. The series is also an important resource for the history of the Pass of the North from the prehistory to the present-day. The chapters include useful bibliographical information. The volumes also document the attempted, illegal acquisition of the Ysleta Grant (Tribal Grant of Ysleta del Sur Texas), which was aided and abetted by the State of Texas – one of the largest land thefts in the history of region. The Tribal Archives are maintained by the Tigua Tribe for official use only. Ysleta del Sur Pueblo Archives, January 2000, Volume 1: Reports by Rex E. Gerald, PhD: “Human Occupation of the Paso del Norte Area,” (June 15, 1970), pp. 9-18; “History of the Tigua Indians of Ysleta del Sur, Texas”, (July 15, 1970), pages 21-43; “The Modern Tigua Indians of Ysleta del Sur, Texas”, (July 15, 1970), pages 43-52; “The Suma Indians of Northern Chihuahua and Western Texas,” (July 10, 1970), pages 53-70; “Copy of the Dossier Advanced by the Indian Juan Domingo Asking that He be Named Chief General of the Suma Nation,” (containing translation, 71-86; “The Manso Indians of the Paso del Norte Area,” (June 1970), page 87-100. Report by Myra Ellen Jenkins, PhD: “History and Administration of the Tigua Indians of Ysleta del Sur During the Spanish Colonial Period,” pages 101-140. Report by Rick Hendricks, PhD: “Report on Land Tenure in Ysleta del Sur,” pages 141-208. Report by Adolph M. Greenberg, PhD with research materials by Nicholas P. Houser, MPH, MA: “Tigua Indian and Land Use Practices”, pages 209-394. Volume I Index, pages 395-408. Ysleta del Sur Pueblo Archives, Volume 2, January 2000, Report by Nicholas P. Houser, MPH, MA, “The Ysleta Grant (To the Place of the Beginning)”, pages 1-358 with bibliography and exhibits; “Interview with Tom Diamond” (June 12, 1967) by Nicholas P. Houser, page 359-369; “Addendum To Houser Interview” by Tom Diamond, page 369-374. 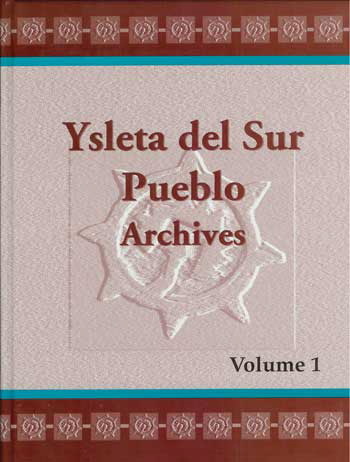 Ysleta del Sur Pueblo Archives, Volume 3, January 2000, Report by Nicholas P. Houser, MPH, MA and Layout by Perry I.Q. Houser, “Tigua Indians of Ysleta del Sur Pueblo Historic Images of the Mission and Pueblo,” (also produced as a separate volume) pages 1-48; Report by Tom Diamond, “Pueblo de la Ysleta del Sur Chronology and Related Historical Material,” Compiled and Edited by Tom Diamond, pages 49-150. By Ronald L. Jackson, “Select Digest of Archival Materials, pages 151-188. By J. Walter Fewkes, “Diary Notes, 1901 – Covering A Trip Through Colorado, New Mexico, West Texas, and Chihuahua”, Edited by Tom Diamond, Transcribed by Irene S. Beckham, pages 189-305. By Adolph M. Greenberg Phd. George S. Esber, Phd. with assistance of Tammy J. Alverson, “General Management Plan Hueco Tanks Park, The Tigua Indian Tribe of Ysleta del Sur Pueblo, El Paso, Texas,” pages 307-377 with maps and exhibits. Ysleta del Sur Pueblo Archives, Volume 4, April 2001, By Elsie Campbell (1950 MA Thesis, Texas Western College), Introduction by Dr. Rick Hendricks, page 1-90 with exhibits. Report by Malcomb Ebright and Rick Hendricks, “The Pueblo League and Pueblo Indian Land in New Mexico, 1692-1846,” pages 91-193 with exhibits and bibliography. By Vina Walz (1951 PhD dissertation, The University of New Mexico), “History of the El Paso Area,” with an introduction by Dr. Rick Hendricks, pages 197-395. Ysleta del Sur Pueblo Archives, Volume 5, Introduction and edited Nicholas P. House, MPH, MA, “Early Accounts of Ysleta del Sur Pueblo by Surveyors, Civil and Military Officials, and Ethnologists,” 173 pages. Report by Nicholas P. Houser, “Tigua Indian Scouts in Defense of the Pass of the North – Three Centuries of Service,” pages 175-182. By Nicholas P. Houser, MA, MPH, “Selected Oral History Interviews Made in Ysleta and the El Paso Region,” (summer of 1966), pages 183-384. By Adolph M. Greenberg, PhD., “Ysleta de Sur Pueblo and the Rio Grande – An Ethnographic Assessment of the Ysleta del Sur Pueblo’s Relationship with the Rio Grande”, pages 386-415.